I am no stranger to the restaurant, Moon River Brewing Company, located on E. Bay street down by the Savannah River. It’s a place that I will always visit when in town, even if it’s just to get an Apparition ale to-go. (You can get beer to-go and drink it on the street while…shopping.) But usually I stick around for a while to enjoy the company of the living. AND THE DEAD! Was that too cheesy? That was too cheesy, wasn’t it? That was too cheesy. This trip, however, was a little different from most because not only did I come for another Apparition ale but I was on a mission to include this place and others in the Halloween countdown series, “Spooky North Carolina”. I know, I know, I know… it’s a different state, but when it comes to material that’s close to a beach and great beer, we can all make an exception, don’t you think? I was hoping to capture the feel of this place by shooting a video mixed with spooky background music and clips from Poltergeist. Not that I am lazy, but I didn’t plan on making anything out of this trip other than a few videos without commentary. Boy was I pleasantly surprised to get the invite and go where few people can, thanks to the sweet staff of the Moon River. It’s a spooky place whether you believe the stories or not. Just about every person who works there has had an experience so just in numbers, it’s really hard to argue that this is only a rickety old building. There are documented duels, murder, madness, plague and the hundreds who died on this property, so it’s a wacky place. 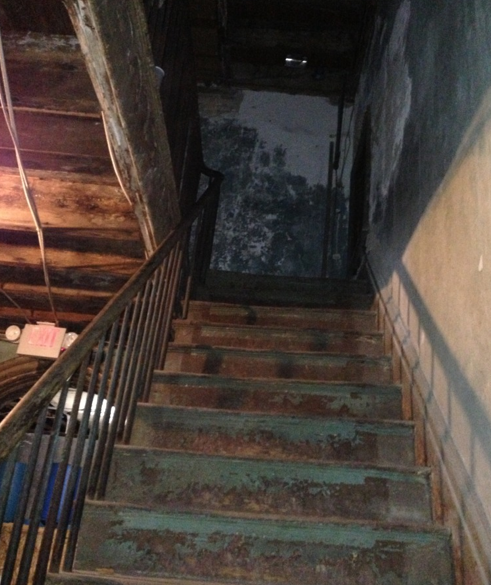 In this episode, we start in the basement and end up in the attic, which is way more than I expected to get and am very grateful to the staff for the fun addition. There are some scenes from the show Ghost Adventures that airs on the Travel Channel because they did one Hell of a job capturing the feel of the darker areas. It helps guide you to where we were and why. I also need to give thanks to the awesome girl who held the camera for me. It must have been a weird proposition but that’s why I am in sales. A.B.C.! I Bought Death. He Was A Bargain. Great stuff, Will! I saw that episode of Ghost Adventures (well I’ve seen them all natch). That’s awesome you got a chance to tour it a bit. I’m sure if you’d gotten to spend some time alone on the 3rd floor you would have had a chilling experience. I was going to laugh if you were holding the beers the entire tour. Keep up the spooky content brother! Thanks man! I actually did get to go up to the third floor but they asked us not to film because (no lie) it would provoke something and the employees aren’t happy to be working when something is restless. Chills.